Provide a generic capability for mapping data from one or more spreadsheets to a common RDF/OWL semantic model for data interoperability and data transformations. Data about cyclones in the vicinity of Australia is available in the form of spreadsheets. 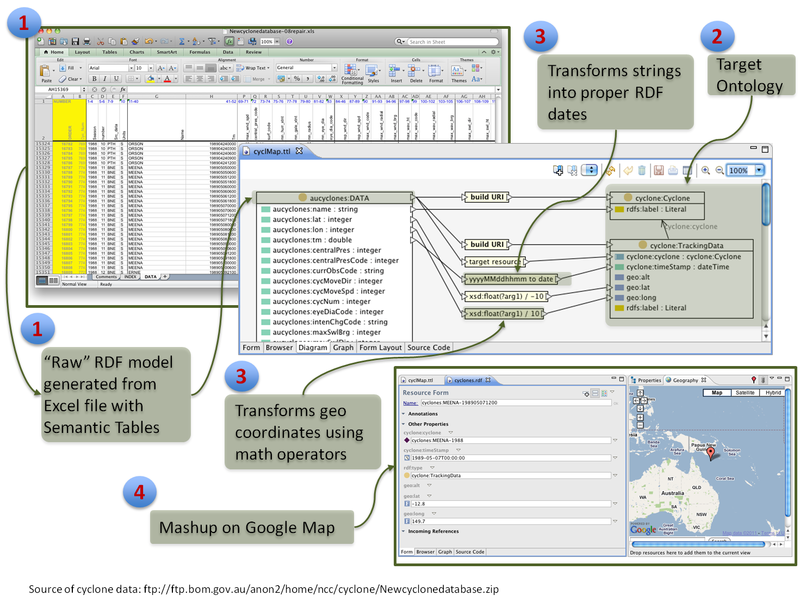 A geo-spatial mashup is achieved by transforming the spreadsheet data into an RDF/OWL model. Data for the Google Map API is generated from the OWL Model. The source of the data is a ZIP file at the Australian Government Bureau of Meteorology web-site. TopBraid Suite provides a spreadsheet import capability called "Semantic Tables" that converts a spreadsheet into an RDF/OWL model. SPINMap is a mapping capability that allows a column of a spreadsheet to be transformed by rules and/or functions to a richer OWL model. A key benefit of the RDF/SPARQL solution is the ability to use mappings to integrate different models. A single model provides an "integrated view" of the data from multiple sources. Even if we were only dealing with one type of information object, new data sources can provide new, unanticipated information. Without a canonical data structure it is harder to merge results from diverse sources. SPINMap provides a graphical approach to describing mapping rules from a canonical representation of a spreadsheet , SPARQL Rules and functions are the basis of the mapping constructs to a common model , TopBraid Composer was used to develop and test the models, scripts and application , other components of the solution: SPARQLMotion - a scripting language for semantic data processing , GOOGLE Maps API , and JExcel for direct importing of Excel spreadsheets and for round trip Excel to RDF conversion using "semantic tables". Copyright © 2005-2011, TopQuadrant, Inc. All rights reserved.